I re-wrote Chapter seven, because a lot of the timing was off.... Anywho, I wasn't going to post it until I'd finished chapter eight as well, but I'm too impatient :P here it is! Storm felt a jolt of shock, as powerful as a bolt of lightning, rip through him. The Clans? What assistance could he and Pool possibly provide? How would they get there? What kind of trouble were they in? A swirl of thoughts clouded Storm’s mind as the shock of this announcement settled upon him. “But what can we do for them? We’re just two cats!” Storm broke in. Storm held her gaze, trying to read the thoughts that swam in her eyes like fish in a pool. For the first time, he noticed how old Stoneteller seemed. Her gray-brown fur hung in ragged clumps on her thin, worn body, the fur around her muzzle had grayed with age, and her whiskers were bent and uneven. He knew that she was on her last life, and that soon she would go to join the Tribe of Endless Hunting, but quiet determination glowed within her bright amber eyes. There was a fire within them that was unquenchable. Storm knew that she would do anything to protect the Tribe, and her wisdom and foresight had made her a very successful leader. “All right, I think that’s it,” Silverpaw meowed. Bluepaw stepped back to survey their work. She and Silverpaw, along with Bramblewhisker and his apprentice, Rainpaw, had just finished patching up the nursery. “Are you warm enough in there, Goldenrose?” Bramblewhisker asked, poking his head into the nursery entrance. “Yes! We’re snug as fox cubs now,” came the muffled reply. Bluepaw felt a twinge of satisfaction. Goldenrose had just recently kitted, and it was important that she and her kits stayed very warm. Leaf-fall was upon the forest, and the air was now quite chilly – especially at night. The Clan often woke to a frost-covered clearing in the mornings, and the leaves on the trees surrounding the lake had turned brilliant reds, goldens, and oranges. “Want to go get something to eat,” Rainpaw mewed. Bluepaw stifled a small mrrow of laughter. Rainpaw, it seemed, was always hungry. Her slender gray body hid the fact that she really did eat quite well. Often times, Rainpaw seemed almost frail, but Bluepaw knew her better than to think that. In the moons that Bluepaw had been a part of ThunderClan, she and Rainpaw had become very close, and Bluepaw knew that underneath that small frame was a healthy and energetic young apprentice who enjoyed life to the fullest. “Sure!” she replied. And the two padded off to the fresh-kill pile, their pelts barely brushing. Silverpaw, after exchanging a few words with Bramblewhisker, bounded after the two she-cats. “Mind if I join you?” he asked when he caught up to them. “Of course not,” Bluepaw quickly replied. After selecting a piece of fresh-kill, the three apprentices took their prey and went to lay down on the basking rocks to eat it. Silverpaw seemed somewhat restless as he ate. He and Sunpaw had been in training for six moons, and it was time for them to become full warriors of ThunderClan. Bluepaw envied them. 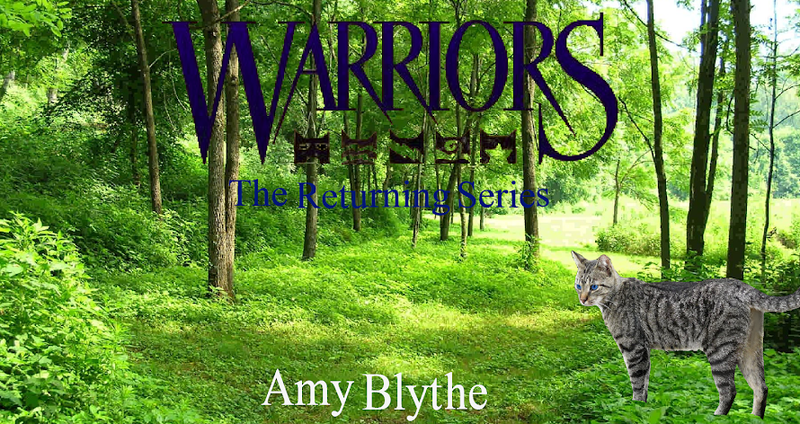 She couldn’t wait to receive her warrior name and become a full-fledged ThunderClan warrior. But she had only been in training for three moons. It would still be a while before she completed her training. Rainpaw had been apprenticed shortly before Bluepaw had come to join ThunderClan, and she was hoping to be given her warrior name at the same time as her friend. After finishing the last mouthful of her meal, Bluepaw started to groom herself. She had just finished when something caught her eye. Sunpaw, along with his mentor Quickstep, entered the Camp followed by Snowstorm and Flashfang. Each cat carried a load of fresh-kill. Snowstorm had recently been given her warrior name, and was almost as bad a nuisance as Flashfang. She acted like she was so much better than the apprentices even though she had been one herself merely a moon ago. It was obvious that she liked Flashfang. She followed him whenever possible, and was more than happy to be assigned to the same patrols as he was. Flashfang pretended to take no notice, but Bluepaw suspected he was soaking up the attention like dry moss soaks up water. After depositing his catch on the fresh-kill pile, Sunpaw selected a plump squirrel for himself and came over to join Bluepaw, Rainpaw, and Silverpaw. “How did it go, Sunpaw?” Silverpaw meowed once Sunpaw had settled down with his prey. Silverpaw sprang to his paws. His eyes shone. His excitement was mirrored on the face of his brother, Sunpaw, who quickly gulped down the last of his squirrel. Bluepaw and Rainpaw followed the brothers as the bounded over to the Highledge where their father, Darkpelt, was waiting for them. Darkpelt looked as proud as any father to see his sons finally become warriors. He circled his kits and gave them each a lick on the forehead before settling down to wait for the meeting to start. Mistyfur emerged from the warrior den followed by Patchear, Smokewhisp, and Eagleflight. Bluepaw noticed that Mistyfur seemed to be spending a lot of time with Eagleflight lately. She was glad. Mistyfur was so nice, she deserved a wonderful cat like Eagleflight to be her mate. Eagleflight padded over to Silverpaw and Sunpaw. “I can’t wait to go on patrols with you two as warriors now,” he meowed. Once all the cats had gathered, including Hazeltail and Bramblewhisker’s three kits, Bluepaw noticed, Ravenstar started the meeting. “Today is a very special day for our Clan. I have the privilege of giving warrior names to Silverpaw and Sunpaw, and apprentice names to Heatherkit, Pebblekit, and Goldkit,” Ravenstar began. Excitement rippled over the Clan. It wasn’t often that the two ceremonies took place on the same day. Bluepaw looked over at the kits. They looked ready to burst with excitement as Hazeltail did some last-minute grooming to smooth their ruffled pelts. Quickstep looked on with satisfaction as his apprentice and Silverpaw stepped into the clearing at the base of the Highledge. “Sunpaw, Silverpaw, do you promise to uphold the warrior code and to protect and defend this Clan, even at the cost of your lives?” Ravenstar continued. “I do,” Sunpaw meowed determinedly. Silverpaw stepped forward to brush pelts with Ravenstar. “Sunpelt! Silverheart!” The Clan enthusiastically shouted the names of their newest warriors. Bluepaw caught Rainpaw’s eye as they cheered for their friends. She knew Rainpaw was looking forward to their naming ceremony as much as she was. “We have another ceremony to take care of,” Ravenstar went on after the cheering had died down. The kits came bounding up, their pelts bristling with excitement in spite of Hazeltail’s careful grooming. “Heatherpaw! Heatherpaw!” Bluepaw called. The rest of the Clan joined in. Eagleflight looked up, excitement showing in his eyes as he stepped forward. “I’ll do my best,” Eagleflight promised. Heatherpaw shyly stepped forward to touch muzzles with her new mentor. “Pebblepaw! Pebblepaw!” Rainpaw started the chant. Pebblepaw proudly gazed at her Clan as they called her new name. Patchear rose to her paws to stand in front of the Clan leader. Patchear dipped her head to Ravenstar before touching noses with Pebblepaw. Goldkit sprang forward, his ginger pelt bristling, and his claws scraping the ground. “I will, Ravenstar,” he vowed, dipping his head. Goldpaw stretched up to touch noses with his mentor. “Goldpaw! Goldpaw!” Silverheart called, followed by the rest of the Clan. Her siblings echoed her vow, along with Silverheart and Sunpaw. “Heatherpaw, would you like to find a nest in the Apprentice den before I show you the forest?” Eagleflight asked his apprentice. Heatherpaw nodded fervently. “Oh yes,” she breathed. She skipped off after Eagleflight to the apprentice den. “Can we start with battle training?” Goldpaw asked Rustclaw. As the eager new apprentices left with their mentors, Mistyfur came padding up to Bluepaw. “One day that will be you standing in front of Ravenstar,” Mistyfur purred. Bluepaw felt her pelt tingle. Yes! One day I’ll earn my name too! Mistyfur and Bluepaw, along with Rainpaw went to congratulate the new warriors. “Congratulations, you two,” Bluepaw meowed. The two brothers dipped their heads, eyes shining with pride. “Thank you,” Silverheart meowed. Bluepaw felt his gaze warm on her pelt and looked away. “I wonder what your warrior names will be,” Sunpelt meowed to her and Rainpaw. A mrrow of laughter erupted from the two new warriors and Bluepaw. Sunpelt shook his head vigorously. “I’d never act like them,” he assured her. “Yeah, what fun would it be acting so prickly and stuck up all the time?” Silverheart added. As the hunting patrol set out, Bluepaw breathed in the crisp air. She loved being out in the forest. I wonder how I ever survived being cooped up inside all the time, she wondered. Warm prey-scent drifted into her nostrils and the dry leaves crackled beneath her paws. Sunpelt let out a purr of satisfaction at the older warrior’s praise. As the group neared the twoleg nest, Bluepaw could taste the acrid scent of the old Thunderpath. No twoleg monsters had driven on it for many seasons – Mistyfur had said it was abandoned even at the time Firestar had led ThunderClan – but it still smelled horrible. Bluepaw had grown used to the earthy smells of the forest around her and now disliked the scent around Twolegplaces and Thunderpaths. Finally, Bluepaw and the others pushed through the bracken and heather that bordered the Thunderpath and stepped out onto the hard, rocky surface. The smell of Twolegs seemed stronger than normal. Something wasn’t right. Bluepaw glanced over at Smokewhisp. He must have noticed it too; he was standing still with his ears perked forward. His mouth was open to let the scents wash over his scent glands so that he could identify then better. Mistyfur was studying Smokewhisp too. She gave him a questioning stare, to which he responded with a flick of his tail. Mistyfur nodded and motioned for Bluepaw and Sunpelt to follow her to the ditch on the edge of the Thunderpath. Smokewhisp crept forward to the stand of trees that grew around the Twoleg nest. He weaved around them, keeping his thin, gray body low to the ground. Finally, he crept around a tree and Bluepaw could no longer see him. “What do we do now?” Bluepaw questioned Mistyfur, worry making her voice more shrill than she had intended. “Well, I guess we just wait,” Mistyfur responded. Sunpelt shifted his weight uneasily. “I have a bad feeling about this,” he muttered. “I’m going to follow him.” He rose to his paws. As if on cue, Smokewhisp came shooting out from the trees, his eyes wide and his neck fur bristling. Mistyfur jerked to her paws. “What is it?” she urgently asked. Smokewhisp looked like he had just seen a whole Clan of StarClan warriors.